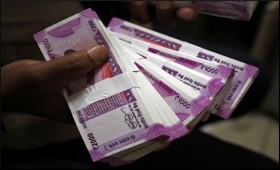 In yet another move to curb black money in India, the government on Tuesday proposed a fresh ceiling of Rs 2 lakh on cash transactions, which is lower than the Rs 3 lakh proposed in Budget 2017-18. An amendment to this effect, was one among the 40 amendments proposed by Finance Minister Arun Jaitley to the Finance Bill, 2017, while moving for its consideration and passage in the Lok Sabha. "In the official amend.to FBill Govt has proposed that limit of 3 lakhs for cash tranx, beyond which it is illegal, be reduced to 2 lakhs," tweeted Revenue Secretary Hasmukh Adhia. "The penalty for violating this is a fine equivalent to the amount of transaction," he said in a separate tweet. Jaitley had proposed that the cap on cash transactions be Rs 3 lakh with effect from April 1. Moving the Bill, Jaitley spoke in defence of amendments made to 40 acts, which had been criticised by opposition members of the house on a point of order. Jaitley said that following the government's demonetisation drive to curb corruption, various income tax incentives had been introduced, including electoral bonds, to deal with black money in political life. This had necessitated amendments to various Acts, he said. The Finance Minister said the government will amend several laws including the RBI Act and Income Tax Act to allow political parties to raise funds through electoral bonds. "Electoral bonds have been announced as a scheme for cleansing political money under the Income Tax Act," he said. "The reality as we all know, a lot of electoral funding to political parties across the spectrum, comes by way of undisclosed money. And this is an issue which is public domain. Therefore, in the Budget announcement we came out with the proposal that there will be income tax incentives involved in four different ways." the minister said. Giving details, Jaitley said these included payments by cheque, bringing down maximum cash donation from an earlier Rs. 20,000 to Rs. 2,000 as per the election commission's recommendation, mass collection through digital media, and electoral bonds in accordance with a scheme under the Income Tax act.